Writing a Children's Book - With my Grandkids - How Much Fun! 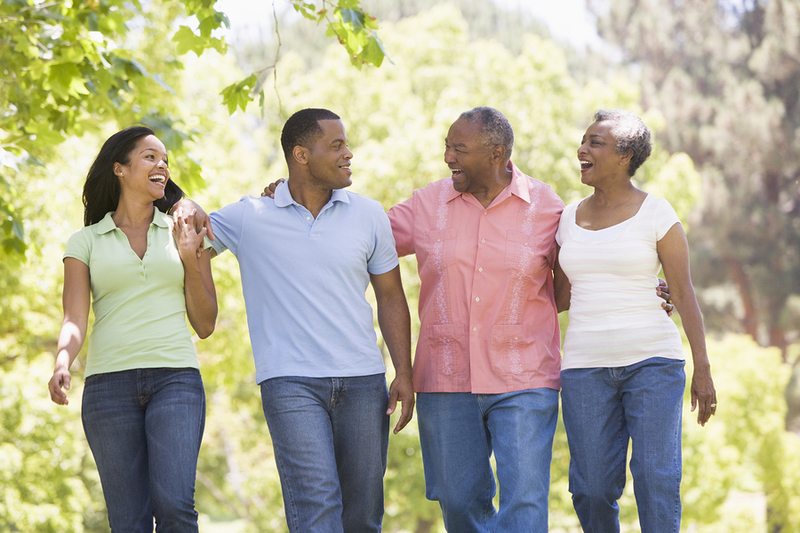 Retirement is when we can try new things, grab new opportunities, and reinvent ourselves. My latest project is a good example. 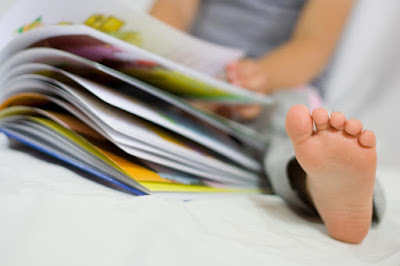 All three of my grandkids love to read. They will take up to 100 books at a time, both print and audio, from the library and get through almost all of them in the three weeks before they must return their stack. They visit Gran and Grandad every Wednesday for a few hours. We often spend some of our time together reading and talking about books. Maybe 6 weeks ago I mentioned to them that my newest books are now available on Kindle. Suddenly, in an excited voice, my grandson wondered if he and I could write a children's book together. Then, both granddaughters chimed in, wanting to help. Just like that, the four of us, along with Betty and their mom were hatching plans, discussing plots, setting timetables, and assigning duties. Josh thought I should write the book while he would be in charge of editing the manuscript and marketing the finished product. For that, he thought there should be a formal "contract" between grandad and him, spelling out how any profits would be split. For his age, he is remarkably attuned to entrepreneurship. So, I found a basic consulting agreement, modified it for our purposes, and promptly signed it. Being only 11, Josh wanted to run the document past his father first. After getting dad's approval, he signed it and we were in business together, certainly not in a legal sense, but together in a project that had him totally involved. The two girls, Kaylee and Kassidy, aged 10 and 8, took over the job of art work for the book. They enlisted Betty's help in taking photographs and converting them into sketches. Both girls huddled over a light table to produce depictions of the important plot elements. I buckled down and wrote a family-based adventure tale. It involves travel, adventure, some danger, and exciting new experiences for the family. It also features a stuffed animal who is as much a part of the family as the mom, dad, and kids. Named, Bobo, he has a brush with danger. Everything ends well (it is a children's book, after all), but there are some G rated tense moments. Not surprisingly, the fictional family has two girls and a boy, roughly the same age as my grandkids. In the story each child's interests and special talents mirror what their real-life counterparts enjoy. It has been loads of fun to make each fictional character like one of the kids and their parents. The dad in the story contains some elements of both me and their actual father while my daughter and wife can see some of themselves in the fictitious mom. We hope to have everything done and published by early fall. Because of the cost we will initially produce a Kindle e-book. But, children love to hold a real book in their hands so it likely we have printed versions available, too. Don't tell my grandson, but making money is not the real goal. It is the execution of an idea from start to completion. It is the tangible production of that dream, and the satisfaction in knowing that together, we completed what we set out to do. 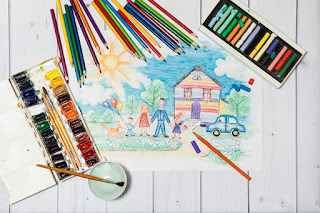 Have you tackled a project with your grandkids, nieces or nephews? Have you watched their faces light up as an idea becomes reality? Have you showed them one of your interests, only to have them get just as excited as you? And, yes, when the book is published, you will be the first to know! Affirmation is very powerful. We know how good it feels to be affirmed by someone for something we have done or said. The person affirming us is making a statement about our worth or competence. I have a friend who is a world class affirmer. He can find something to praise about anyone at any time. Importantly, he is completely sincere. He doesn't say something just to make the other person feel good, but because he truly believes the affirmation he is offering. He got me thinking about the amazing power of positive affirmation and how easy it is to make someone else's day. I try to emulate his example whenever I can. I will be the first to admit I have been a poor affirmer in the past. My family sometimes jokes that my empathy was removed at birth. But, I have been working on getting better. Trust me, if I can do it, anyone can do it. 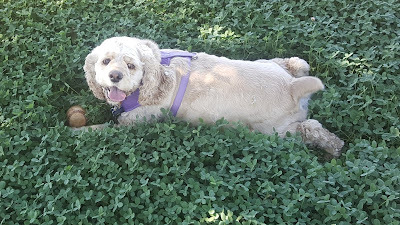 I happened to be at our neighborhood park not too long ago, walking our dog, Bailey. It is a large, busy park and usually very clean. I wandered by one of the fellows who was emptying a trash can and straightening a picnic table. I remarked how well maintained the park is and we appreciate his efforts. The smile I received in return was as bight as the noon day sun. You would have thought I'd given him a winning lottery ticket. A simple heartfelt comment cost me 5 seconds but probably made his day. I imagine a park worker rarely gets complimented, but for a job well done, why not? Engaging in pleasant conversation with a checkout clerk is another way to affirm someone who rarely gets that type of positive stroke. Rather than treating that person as invisible, say something pleasant or compliment the store's selection or.... it almost doesn't matter. Being treated like a fellow human being by acknowledging his or her presence in a positive way is painless and has tremendous power. Betty and I will go out of our way to interact with a particular clerk at the grocery store we frequent. Even if another line is shorter we will almost always spend the extra time, just because it seems to make her day. We are on a first name basis with each other. She tells us about her problems while we share ours. She enjoys bantering with me as I give her a tough time about almost everything. She beams when she sees us each week and always says she will see us next week. Besides affirming her, we enjoy our time with her each week. Of the hundreds of people each day who watch her ring up their food purchases, can you imagine how good she would feel about her job if even a few dozen of those customers talked with her and complimented her with a simple "thank you" and wished her well? 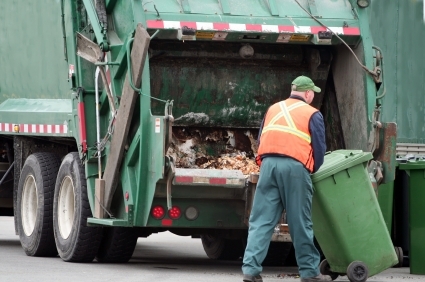 Have you ever said something to the person who picks up your trash? If I am outside when the truck comes by I make it a point to simply smile and salute the driver with a quick wave of my hand. A library worker who is re-shelving books deserves a quick thanks for how well the library is run or how glad you are that the book you placed on hold is available. One of the worst jobs has to be an office worker or receptionist in a doctor's office. All day long they deal with people who are sick or in pain. They have to hear horror stories about insurance companies and rising premiums. Of course, it isn't their fault. Treat them with respect as professionals doing the best they can in a broken system. Heavens, even many doctors would benefit from a little affirmation. They didn't design the system that forces them to see 10 patients an hour just to stay in business. It comes with different names, like random acts of kindness. But, in its simplest form it is treating another person the way you'd want to be treated. Affirmation and recognition of a job well done are powerful weapons in the war against incivility. Our society needs all the warriors we can muster in this battle. Maybe a dedication to positive affirmation is one way each of us can make our world a little more pleasant for everyone. How's this for an affirmation: to my darling, love of my life, two months ago we celebrated 42 years of marriage. I have never been happier or more convinced that we are so very good together. 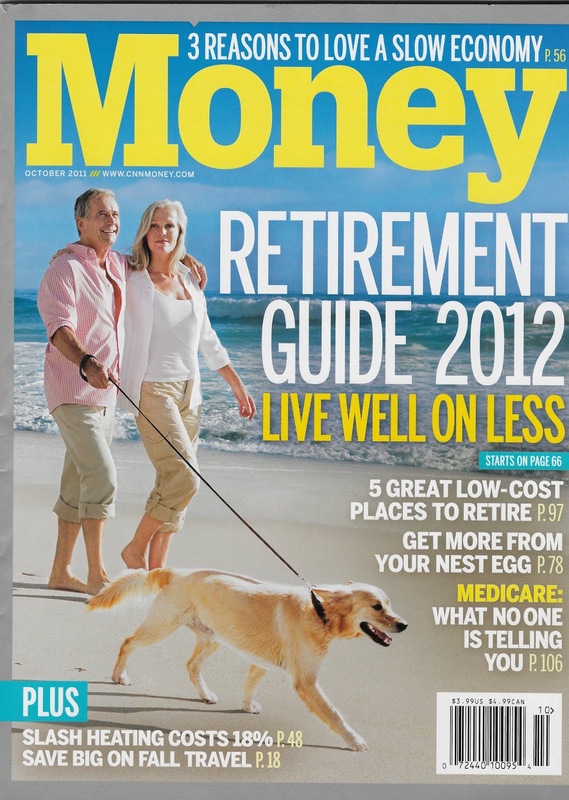 Retirement and Pets: Do They Limit Your Lifestyle? I may not be entirely objective. Two dogs while growing up and five so far after getting married makes me officially a dog person. For a good part of our 42 years together, Betty and I had two dogs, one designated as our "emergency backup" pet. She was trained and an important part of our family, ready to assume the alpha role when an older pet passed away. We went for one miserable stretch of six years without a dog. Not having a furry friend by our side did not make us happy. One of the reasons we bought an RV and spent nearly five years traveling around the country was because of our dog, Bailey. Having a motorhome means no worries about finding a motel that will accept pets. It means no hassles at meal time when one person stays with the dog in the room while the other runs to a fast food restaurant for take-out. Traveling with a pet is a natural conversation-starter in RV parks, where virtually everyone has at least one dog on a leash, often two or more. Our youngest daughter spends a good portion of her year traveling. 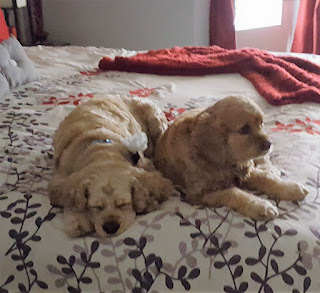 When she is gone for a week or two, her dog, Adler, stays at our house and becomes a companion for Bailey, sleeping on our bed, and behaving like she belongs (which she does!). There are some trips Betty and I would like to take that would keep us away from home for three or four weeks. Longer cruises, long distance train trips, or even a road trip or two beckon us. 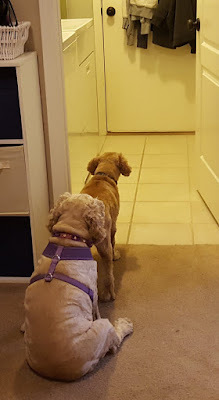 Unfortunately, that is much too long to put dogs in a kennel and even too much to ask our daughter to babysit two dogs at our house for a month. Honestly, we would miss the dogs terribly over that long a stretch, too. So, we have decided that type of extended travel just isn't in the cards. The tradeoffs are too severe. Two weeks is our limit. Bailey probably has another 6 or 7 years with us, while Adler will be likely with us for another nine or ten years. Since we think we will be ready to move to a retirement community in the next ten years, the doggie timing actually works well. Will we get another dog for our time at a retirement community? Probably. The costs, worries, limitations, and heartache when a dog dies are so insignificant in comparison to what a pet gives us in return. I do know some retired folks who like the freedom to come and go as they please without having to think about the care and feeding of a pet. 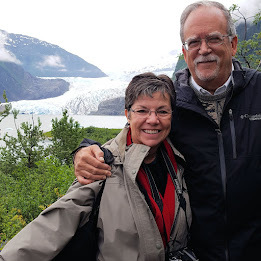 Part of what makes their retirement so satisfying is the spontaneous nature of their travel and adventures. A dog (or any pet) makes that too difficult. I completely understand. As I noted above, there have been times when I have been frustrated by the inability to plan for something because of our dogs. But, for us, it is been a simple decision: Bailey and Adler bring way too much joy and love and laughter into our home to ever want to trade that for a vacation. If that means no 28 day cruise to Tahiti or a month-long road trip to New England, so be it. Do pets impose some limits on a retirement lifestyle? Yes. Are they worth it to us? Absolutely. Beyond measure. "I heard something. Are They coming home?" How Do Retirees Save Money? It's hard to believe, but the interview and photo session at our home for Money Magazine was seven years ago. The photo shoot took place in our backyard in August, in Scottsdale. I don't think the magazine people realized how hot that would be. Since then so much has happened in my life, and yours. Some things, though, never change or go out of style, like our interest in how people save money. The article detailed what others were doing to cut expenses and make their retirement lifestyle fit their circumstances. One couple underwent a major downsizing of their home. From a 5,000 square foot house, they moved to to a a one bedroom loft condo. I thought downsizing from 3300 sq. ft to 1750 sq ft was tough, but these folks did some serious pruning. Home association and maintenance fees are nowhere near what they used to pay in property taxes and upkeep. This steep reduction allowed them to vacation in Europe and dine out often. One topic I have addressed a few times since the article is the place of automobiles in the satisfying retirement lifestyle. One of the retirees has eliminated her car completely. She has found the $5,000 a year savings in insurance, gas, and maintenance is much more than what public transportation or simply walking where she needs to go costs her. Living in a densely populated urban area with decent public transportation would probably be required for being car-less to be practical. I could never pull it off where I live in the suburbs of Phoenix. But, there is a certain attraction. In some cities a car-sharing option is available. Like a short term rental but much cheaper, autos are available for running errands or appointments. Then, they are dropped off at a certain location where the next person picks it up. And, of course, if you don't own a car but want to drive somewhere, there are plenty of companies that would love to rent you a car for that purpose. When this article was published the idea of an Uber or Lyft didn't exist. Now, it is a practical choice for occasional rides. Paying off the mortgage and becoming debt free was the path to retirement happiness for at least one of the couples profiled in the article. While not everyone can do this prior to retirement, it should be a goal to accomplish as soon as you can. There will be some financial advisers who will tell you I'm wrong; you should use the mortgage deduction and invest the saved money. In some circumstances they are probably right. But, from personal experience I can tell you having no mortgage, no credit card debt, and no auto loans to worry about is a tremendously liberating feeling. You feel much more secure knowing there isn't a giant sword hanging over your head. One couple had made it their business to maximize the power of discount coupons, 2 for 1 offers, and finding ways to cut travel expenses. This isn't the extreme couponing that was popular several years ago. That involves getting food almost free by buying only items with coupons in situations where they can be tripled or trigger rebates or free products. It means stocking up when something is available in this way. This couple simply used scissors and the paper or mail to gather bargains. Of course, if the article were written today that couple would probably be using all sorts of sites on the Internet and apps on their smart phones. Discount travel sites are easily found. Airbnb and VRBO were much smaller, localized companies seven years ago. Today, they are must-use places for many looking for great deals during vacations. That couple's use of dining and other discount coupons used to a part of our way of life, too. Places like Groupon, Deal Chicken, and Living Social once filled my inbox with offers. Over the past few years, we decided that was too much hassle, plus some of those companies have gone of out business. Remember the printed Entertainment book with tear-out coupons? Now, we make use of happy hour price cuts or share a main course. These approaches are less expensive, but also better for our health. "I have less money than when I worked but I enjoy my life even more." That quote from one of the folks in the article seems to sum up the attitude of everyone interviewed. I couldn't agree more. Living well on less is doable and enjoyable. Would you mind sharing some of your money-saving tips? We love them and can't seem to get enough of them. What Does a Satisfying Retirement Mean To You? One thing has become abundantly clear in the eight years this blog has been published: there is no one answer to what a satisfying retirement looks like. What may have been a satisfactory answer just a few years ago, may no longer apply. The retirement landscape is continually shifting under our feet. Even the idea of traditional retirement age is in flux. 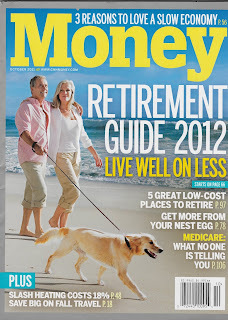 You have probably read the same headlines that I have: the "new" retirement age is 70, or 80, or not at all. At the same time, the Internet is filled with examples of folks who aim to retire at 40, or even 30. Retiring before a typical career has even begun seems to be the goal. I guess we can conclude that retirement is a fluid idea and one defined by the person experiencing it, which is the point of this post. I'm pretty sure that all of us enjoy reading how others have done something: tackling a problem, making a decision about medical care, deciding where to live, hiring a personal trainer (! )...almost anything open to individual responses and decisions. At least for me, I learn something every time a comment presents a new way of living, a different approach to something, or a fresh interpretation of what satisfies someone. So, here is your chance to help us all. What does a satisfying retirement mean to you? How do you define a lifestyle that is satisfying? How have you changed your view on this issue over the last few years? Is retirement still a valid concept? What is the difference between a satisfying retirement and just being retired? Can a satisfying retirement include going back to work, either full or part time? If you have not retired yet, do you still believe you will be able to and be happy? OK, your turn. Please don't feel compelled to answer all these questions, just the ones that mean the most to you. I am not going to answer from my perspective at this time, though I may take your comments and turn them into follow-up posts. I really want to get a sense for how you are mentally handling the re-positioning of retirement. 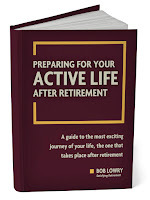 What leads you to believe that you can craft a retirement that is satisfying? I get a strong sense that a majority are comfortable in where their life is at the moment. But, that doesn't include everyone, and it certainly doesn't mean a retirement that looks anything like the one your parents lived. Fire away...and fill the page! Are Personal Trainers and Coaches Worth the Money? We all know the value of regular exercise. The problem for many (that's my face in the mirror) is maintaining any sort of exercise plan. Even if it involves just walking around the neighborhood for 30 minutes three times a week, we are good at finding excuses to skip a day. 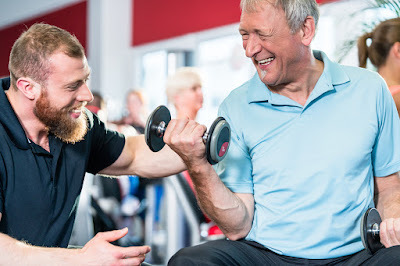 Of course, there are plenty of retirees who can't engage in a typical exercise program due to physical limitations or family obligations, like watching a grandchild all day. I understand that occasionally life gets in the way and the best laid plans fly out the window. For those able to exercise, motivation and commitment are two major hurdles. Certainly, I know folks who thrive on being as physically active as possible. Long bike rides, hiking, kayaking, snow skiing...these people need no extra push to keep their blood pumping. For the rest of us, with me in the front of the line, maintaining a regular program designed to enhance our fitness and help delay some of the ravages of time, is too easy to abandon. I use the excuse that summers in Phoenix are too hot. Of course, that is silly: the gym is 5 minutes away. Or, I get engaged in writing a post and when I come back into focus the time to get physical has passed. All excuses are very human. So, a reader suggested I ask you about the place a physical trainer or coach might play in the life of someone who needs the extra kick, the kick that comes from paying someone to prod you to do what you know you should. Coaches for improving one's golf game, music lessons, cooking classes...none of those seem unusual. But, the thought of paying for a session with someone who job is to push you to exercise correctly seems very different. The cost is no more than for any type of lesson or class. If improving physical fitness is a laudable goal, then why not? Is a personal trainer just different somehow? My gym offers Silver Sneaker exercise classes that are free with my membership. Someday I may take advantage of what they offer. But, for now, the chair-based sessions or moving at half speed while lifting weights is not what I need. I need to be pushed a bit to achieve some noticeable goals. So, I ask you: do you use a trainer? 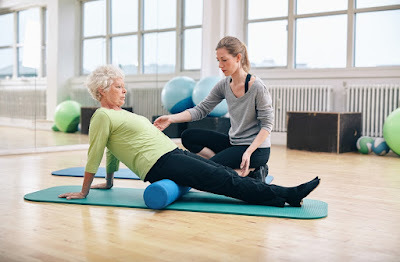 Have you ever paid for someone to help with with an exercise program? Was the cost worth it? Where there any downsides? Or, should I be able to motivate myself to do what is need to be done? The second in a series of three new booklet-length resources is now available. 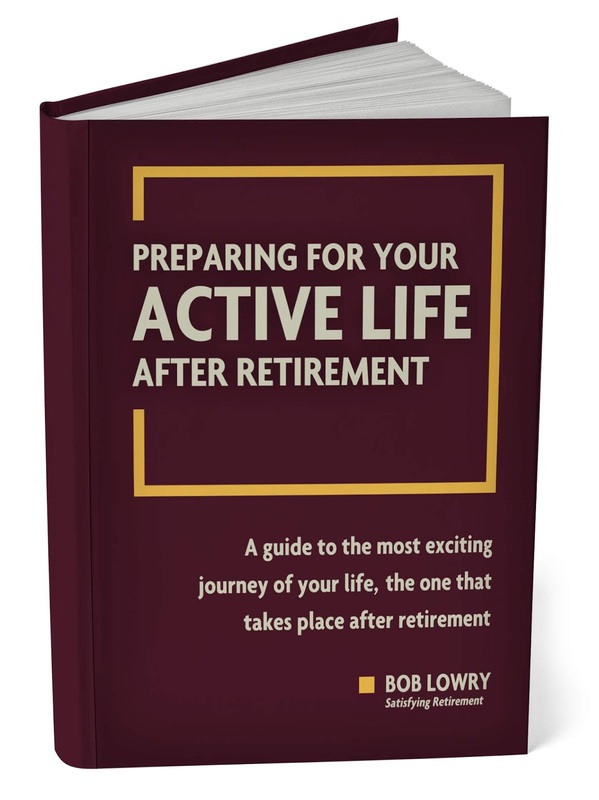 Preparing For Your Active Life After Retirement is a guide to the most exciting journey of your life, the one that takes place after retirement. Whether you are still working toward this new phase of your life, or already there, Preparing For Your Active Life should be one of the resources you consult. Of course, that means we are just as vulnerable to all the bad stuff that happens online. 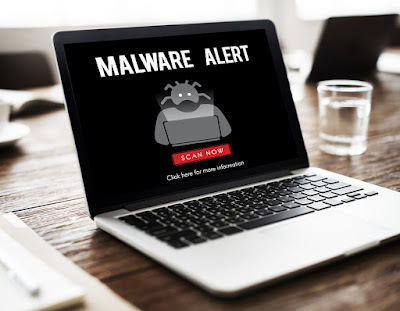 The latest figures I could find say that a new computer virus or malware program is created every 4 seconds. The absurdity of people finding new ways to hurt others at such a relentless pace is a subject for another post. This time, I'd like to focus on some practical ways we can protect our online selves. 3). Never click a link in an email unless you are very sure it is safe. Friends can unknowingly pass along computer viruses. Social media links are notoriously risky. A link that takes you from one web site to another may not be what it seems. Look carefully at the computer address you are being redirected to. If it doesn't look legitimate don't click it. 5. Use pop-up ad blockers. Chrome, Edge and Firefox have add-ons that block a lot of the ads that appear on your screen. If they are not there you won't be tempted to click something that might be dangerous. 6. Use strong passwords. It is amazing how many of us still use passwords like, "12345" or "password." Even obvious choices like your birthdate or old phone number are simple for a bad actor to crack. A combination of upper and lower case letters, interspaced with random numbers and punctuation marks is best. 8. Never, ever, take an online poll or answer questions about yourself on a social media post or smartphone app, like "answer these 10 questions to find out where you should live." You are giving away private information that could lead to a malware attack. At the very least, you are helping advertisers target you with a constant barrage of ads. One exception: I will occasionally add a poll to this blog. That one is safe! 9. Don't leave your computer connected to the Internet when you are not using it. That allows for the potential of someone entering your computer through your router and leaving something nasty. When you are finished using it, delete all your browsing history and shut it down---not just let it go into sleep mode, but turn it off. 11. 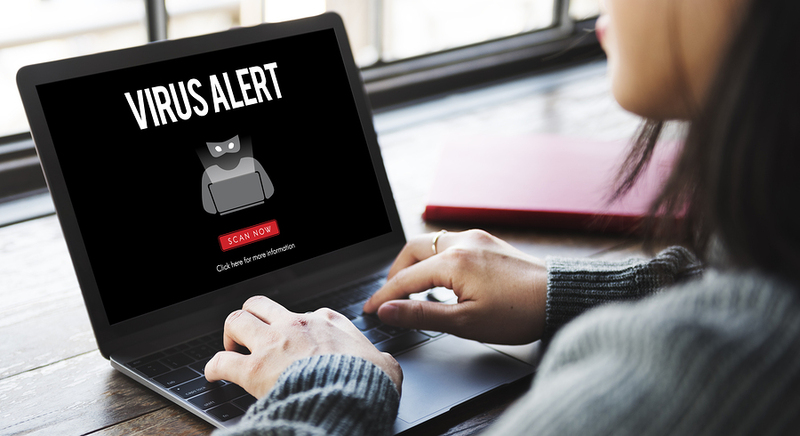 If you do suffer a ransomware attack, do not pay. There will be no end to the demands and no guarantee the person will actually remove the damaging software. Immediately try the Control-Alt-Delete action to go to the Task Manager. Try to shut down the offending software. If that doesn't work, unplug your computer from the wall. There are some things to try if you are computer savvy, but they are beyond the scope of this post. Financial Sharing With Adult Children: How Much and When? 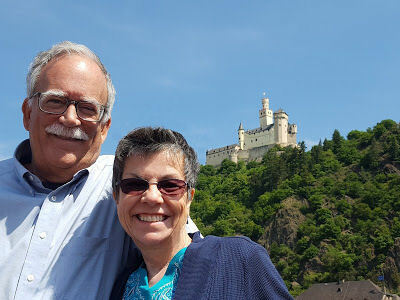 "We are happily retired, and my husband & I know that we need to talk financial specifics with our adult children, but we seem to keep putting it off. And, yes, we know that *not* doing this will complicate their lives if we were to both die without doing it. So I would love to see a post & comments from others about how to handle this important conversation — when, how, what specifics and how much to disclose." I have written about the need for spouses or life partners to share financial details, duties, and information with each other. Since one half of a couple usually handles most of the money stuff, the other person could be in a terrible bind after the death or incapacitation of the "financial" person. If you haven't read one of the earlier posts, please start with Protecting your Partner's Financial Well-Being. The subject is much too important to put off until another day. For this post I am going to shift my focus to the question asked by the reader. 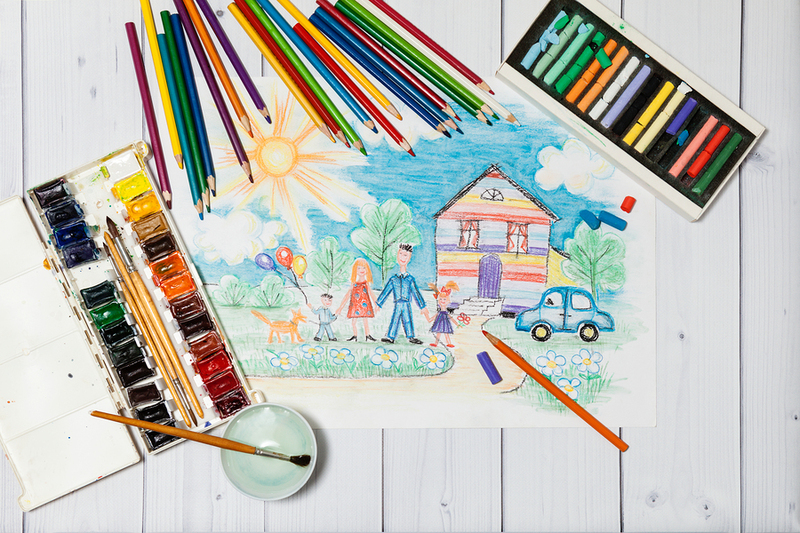 What about a couple's offspring: their adult children, through birth, adoption, or a blended family...what financial details should be shared with them? When? How? How specific? That is a great question I have not dealt with before. But, I have no fear in writing about it since I know your comments will be the ultimate guide. I would guess the financial stability of an adult child could enter into your consideration of how much you feel like sharing. Is there a chance you will be using some of your nest egg to help your children sooner rather than later? If so, they would probably feel more comfortable accepting your help if they knew you wouldn't be hurting your own retirement. That would require at least enough of an overview to raise their comfort level. Personally, I'd share less information with a GC in his or her 20's or early 30's than someone older. Why? A younger adult has to learn and experience some of the basics of financial decision making before being able to fully understand more complex arrangements. Of course, this really depends on the maturity level of the person in question. There are some young adults I'd trust to understand what I was explaining or how to handle my finances if I were unable to. But, that may be the exception. If yes, then certainly that person needs to know what you are working with. If you think you or your partner's ability to handle your investments and basic financial duties may be slipping, the amount you share could be substantial. If you are doing just fine, then there is no reason to put that extra responsibility on an adult child yet. Share enough to make him or her feel trusted and part of the long term plan, but don't cede control too early. Now, your turn. If you have faced the questions posed by the reader please tell us how you handled this situation. If you have grown children but haven't shared much, what is your thinking? Do you plan on bringing them into the loop in the future? This is a fascinating area for discussion. It impacts you, your adult children, their children, your relatives' children..all sorts of folks will be impacted by how this situation is handled. I am really hoping for all sorts of feedback and guidance. The Social Security Administration says that 21% of married couples and 43% of single seniors depend on Social Security for 90% or more of their income. 59 million Americans receive a monthly check, either for being over 65 or for a disability claim. Those numbers tell the story: Social Security is important, or very important, to a large number of us. That leaves one of the key questions before the deposits start appearing in our checking account: when to start? As I have written in earlier posts, there is no simple answer. Because there are so many variables no one can give you a fail-safe answer. Your best approach is to understand the factors that help you make the decision that right for you. 1. If you have worked at least ten years you are likely to qualify. The actual requirement is 40 credits, which occur at the rate of four for each full year of employment. Those 10 years do not have to be in a row, they just have to occur before you can claim benefits. 2. Your actual monthly benefit is based on your highest 35 years of earning. As point #1 above states, you don't have to work 35 years to qualify, but the amount you receive will be based on the highest income you earned if less or more than 35 years. This means lower earnings when you begin your career are usually replaced with higher earnings later in your employment history. 3. If you never worked, or not enough to get 40 credits, you may still qualify for Social Security payments, either as the spouse of an employed person who does receive benefits, or because you qualify for disability payments. 4. Deposits to your account run one month behind. When you sign up to start receiving payments, your first deposit will come the following month. Exactly when you receive your check each month is based on your birth date. 5. Social Security no longer sends physical checks through the mail. You must make arrangements for direct deposit. The other option is for your funds to be deposited into a special debit card that can be used like any debit card for purchases or to get cash at an ATM. A. When you start receiving payments is up to you. The earliest is when you turn 62. The first payment will arrive the next month. 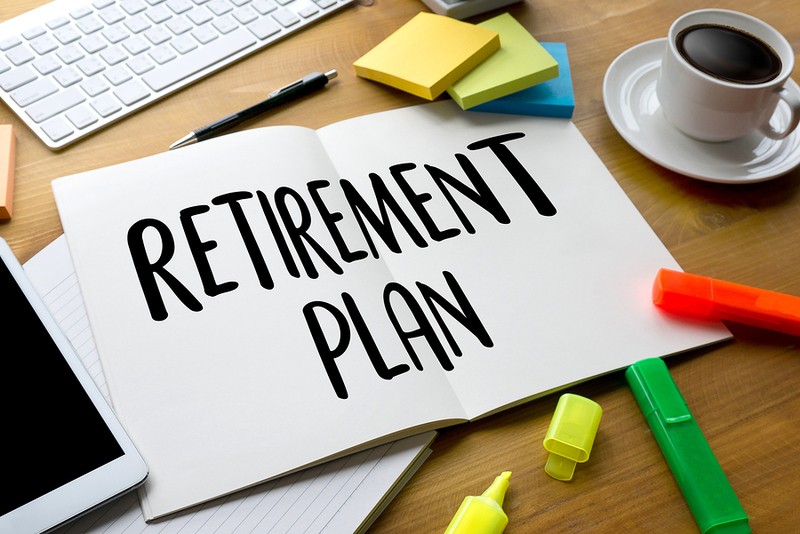 Staring at 62 will reduce your monthly check by about 25% from what you would receive if you waited until you reach your full retirement age (FRA). For most of us that is 66. The FRA varies by your birth year, moving up two months for every year after 1954. So, if you were born in 1955, your FRA is 66 years and two months. B. You can start receiving payments at any time after your 62nd birthday until age 70, at which point your check will be approximately 30% higher (depending on your exact FRA). There is no reason to wait past 70 since benefits do not increase after that date. You are just leaving money with the government that you will never get. C. You lose $1 in Social Security benefits for every $2 you earn if you start before your FRA, continue to work, and earn over $1,420 a month. There is a different calculation in the year you reach your full retirement age that lessens this penalty. D. After your full retirement age, there is no reduction in Social Security payments regardless of how much you earn. E. Social Security benefits are taxed depending upon your total income and marital status. If you exceed the rather low minimums set by the government, between 50% and 85% of your Social Security income will likely be taxed. And, yes, your Social Security counts as part of your total income to determine if it will be taxable. 1. Do you need the maximum amount of payment to make your financial picture work? Do you have enough other income, or will you keep working until at least 70? If so, it is suggested you start Social Security when you turn 70. Your benefits will be at their highest level for the rest of your life. 2. Do you need income now to keep things afloat or as additional income while still working? Start at 62 or any year after that until 70. Your check will be permanently reduced, but maybe not enough to make up for the loss of cash now. For example, I began taking payments at 64. Waiting until 66 would have meant only $132 more per month which didn't seem worth it. 3. Spousal benefits require another calculation which is beyond the scope of this post. Basically, you can get an amount equal to half of your spouse's check, or your own amount if that is higher. 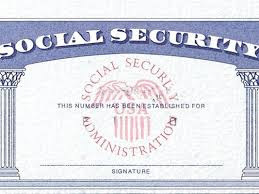 Social Security will figure out the proper combination to insure your monthly check is the maximum allowed. Obviously, this benefit is not available to single folk. 4. If married and your spouse dies, there are other provisions to provide benefits based on the amount your partner was receiving. I have provided some links below if you'd like more details. 5. Divorced? There are rules for that, too. See the link below. When your start your Social Security payments takes some thought and planning. Frankly, though, it is not as complicated as some financial experts like to make it. Start when receiving that monthly payment fits your current needs, situation, and future projections. Any questions? Leave a comment or drop me an email and I will try to clear up any confusion!